Student loan default is what happens when you don’t pay your student loans. Your student loans are turned over to a debt collector, who then attempts to collect the debt. At this point in time, you’ve likely already seen your loan balance rise, late payment fees have become part of your loan, and interest continues to grow. However, President Obama did try to help borrowers in this situation – he prevented debt collectors from charging excessive default fees. This was supposed to help borrowers (and in turn, all taxpayers – since student loan default hurts all taxpayers). If your student loan is in default, you may be faced with an unpleasant surprise. Not only are you reeling from the stress of being in default, you are also about to get hit with high fees on your past due loans. Below, we will examine the impact of Donald Trump’s recent actions against defaulted student loans, and how you could be affected by recent developments. Not too long ago, the Obama administration offered guidance (in the form of a memo) on collection fees for student loans, which was instrumental in a court case. This memo was issued after the circuit court of appeals asked for guidance in a case against United Student Aid Funds (USA Funds) challenging the assessment of collection costs. In this case, the borrower was charged $4,547 in collection costs on a defaulted student loan. The company assessed fees on the borrower even though she signed a “rehabilitation agreement” with USA funds to set up a reduced payment schedule to resolve her debt. Education officials sided with the borrower, which prompted USA Funds to sue the department in 2015. USA Funds has agreed to settle a class action lawsuit resulting from this case for $23 million, though it does not admit fault. President Obama’s administration issued a memo on the Federal Family Education Loan ( FFEL) program which prevented the agencies from charging fees for up to 16% of the principal and accrued interest owed on the loans, if the borrower entered the government’s student loan rehabilitation program within 60 days of default. Recently, Trump has rescinded guidance issued by Obama that made life easier for those who default on their student loans by getting rid of exorbitant fees and charges to those who already couldn’t pay back those loans. The Education Department is now ordering guarantee agencies that collect on defaulted debt to disregard this memo. The letter from the Trump administration walks back the department’s previous stance on the grounds that there should have been public input on the issue. A report from the Consumer Federation of America (CFA) revealed that millions of borrowers had not made a payment on $137 billion in federal student loans for at least nine months in 2016, a 14% increase from the prior year, and tens of thousands of borrowers with multiple defaults. Days after the CFA report was released, President Trump’s administration revoked the federal guidance that barred student debt collectors from charging high fees on past-due loans. The average federal student loan borrower owes $30,650. The amount owed per borrower continues to rise. Federal Loans By Financial Institutions Are $137 Billion In Default. For federal loans originated by financial institutions (FFEL) and the US Department of Education (Direct), a total of $137.4 billion in balances were in default. There were slightly over 1 million Direct Loan defaults in 2016. In 2016, 1.1 million Federal Direct Loan borrowers went into default (270 days past due). While the action affects nearly 7 million people with $162 billion in FFEL loans held by guarantee agencies, it does not affect any borrowers whose loans are held by the Education Department, according to the department. However, nearly half of the total outstanding student debt in default comes from the FFEL program. There has been a steady increase in the total amount of past-due debt in the program, while the number of borrowers has declined, suggesting that interest charges and other fees are inflating the loan balances. If your student loans are in default, you can take immediate steps to avoid unnecessary fees. A simple phone call with your loan servicer could help you avoid additional costs. You could also work to rehabilitate your student loans as quickly as possible to avoid further fees. 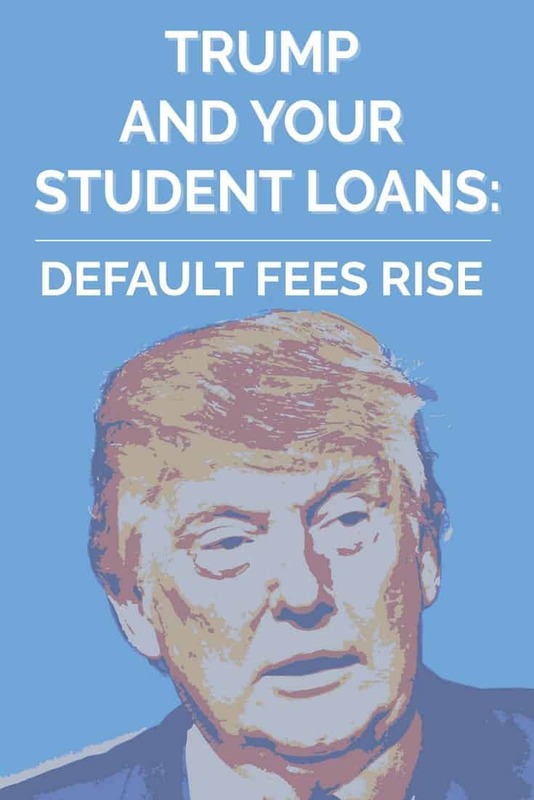 While Trump’s recent action may mean higher fees for student loan defaults, if you are in default, you will need to explore all of your options and save money fast to set it aside for catch up payments. We can still hope that Senator Warren and House Representative Bonamici’s letter will change Trump’s mind in rescinding borrower protection for student loan default. Until then, you must be proactive and explore all options to prevent default.